IDS is widely recognised for our unique & continuing focus on developing innovative & high quality products. We are driven to provide specialised doors that offer solutions, sustainability and durable designs to our clients while providing quality, an exceptional service at competitive prices. IDS manufacture high quality specialist GRP – Glass Fibre Reinforced Polyester which are specially designed for internal premises that requires hygiene, water and moisture resistance additionally offering extreme durability. 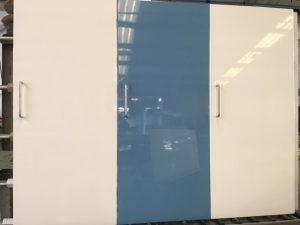 GRP doors are manufactured using a pressure moulding process which create a seamless door with no joints and are non-porous. Door leaf is a 40mm thick pressure moulded Glass fibre Reinforced Polyester door-blade. Seamless structure, non-porous , extremely hard but lightweight for ease of use. The Door blade is waterproof with no joints allowing for rigorous & safe cleaning. The door leaf core is manufactured with a closed cell high density foam, and a layer of lead, copper, sound absorbing sheet or any other required layer of protection which is industrially bonded within this core of the door leaf. Available in adjustable, powder coated aluminum frame or anodized aluminum . Stainless steel GRP frame additionally available. 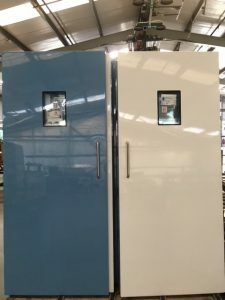 IDS GRP doors are available in a wide range ofRAL colours.